One easy way to save money is to buy in large quantities, or in other words, in bulk. The quantity that you want to buy depends on the item and on your household’s usage patterns. I am living on my own, so it doesn’t make sense for me to buy in bulk for many items, especially those that have a short shelf life. I just wouldn’t be able to consume the item before it goes bad. But for other items, it definitely makes sense for me to buy in bulk. I recently needed to purchase new vitamins. For the brand and type I purchase, it’s $10 for 50 vitamins at my local Target. Woah. That is expensive. On Amazon, they’re $18.50 for 150 tablets and qualify for free shipping. That’s a little easier to swallow (pun intended!). Since I needed to purchase another item for free shipping, I went searching on a deals website to see what else I could add to my cart. I discovered that my brand of shampoo was on sale, so I ended up buying two big bottles of Dove shampoo. Now I must warn you that buying larger sizes does not always save you money. You have to look at the price per quantity information on the store price tag. In addition to the price of the item, the unit price is also broken down. That way you can tell how much you save or don’t save by purchasing various sizes. On a recent trip to Target, I was looking for M&Ms to refill a candy dispenser I have at my house. This candy machine takes massive amounts of candy, so I was just going to grab the giant bag and be done with it. 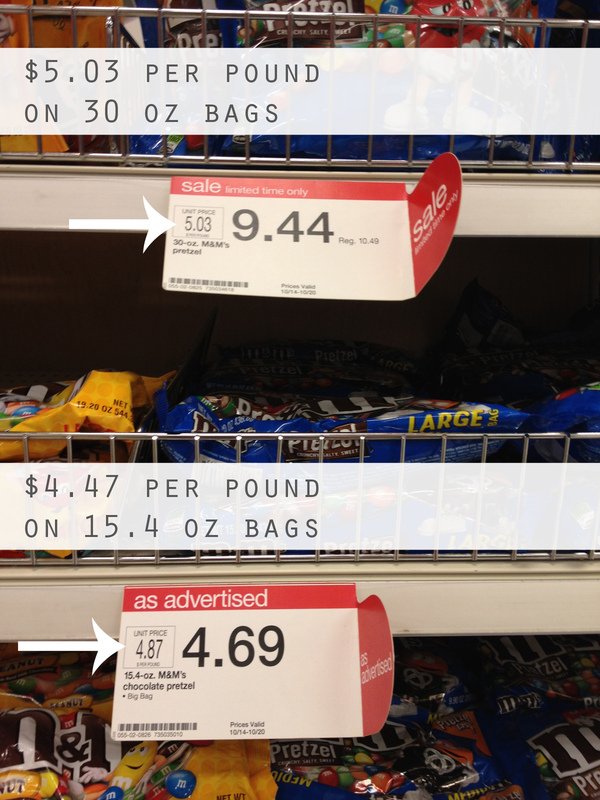 However, it made more sense to buy multiple of a smaller size, since the unit price of the jumbo bag was actually higher than the smaller sizes. So the moral of the story is that buying in bulk can often save you money. Sometimes it’s just a couple bucks, but it can often be significant. However, it’s important to check the unit price to be certain you’re getting the best deal.